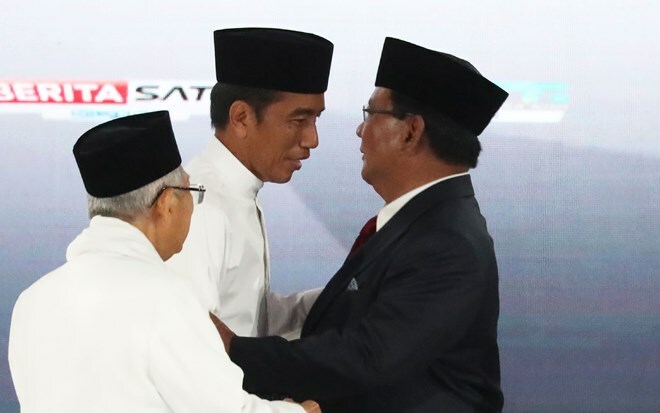 Jakarta (VNA) - The fifth debate, which is the final debate between two presidential candidates of Indonesia Prabowo Subianto and Joko Widodo, took place on April 13 in Jakarta, focusing on economic and social welfare issues, finance, investment, trade and industry. The General Elections Commission of Indonesia (KPU) assigned ten economists from universities to work as connectors, who were responsible for preparing questions on issues that were discussed at the debate. During the event, Prabowo said he would work to increase the value for the industrial sector, saying that Widodo only focused on infrastructure development, making the country’s industry has been slowly developing. He highlighted the importance of promoting industrial development and maintaining certainty in business, saying that these will play a vital role in fostering development of the industry and fishery sectors. For his part, Widodo said infrastructure development is part of the first stage in his economic development plan. The Indonesian President said infrastructure facilities will be connected to industrial areas, tourism destinations and construction sites. On April 17, around 192 million eligible voters across Indonesia are expected to flock to polling booths to cast their votes for their representatives at the House of Representatives (DPR), Regional Representatives Council (DPD), as well as provincial and district/city legislative bodies.